Time magazine's August 10 edition with President Barack Obama on the cover (“Paging Dr. Obama”) trying to heal the nation in a photo illustration as a physician, wearing a white smock with a stethoscope around his neck, brings to seven the number of issues the magazine's cover has featured Obama just since November's election -- make that eight for the First Family if you add in June 1's genuflecting “The Meaning of Michelle.” Amongst the seven of President Obama: “Person of the Year” and Obama as FDR. 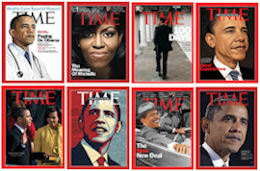 Well, not thirty, at least not yet, though at about once per month Time will hit thirty Obama covers well before the 2012 vote. 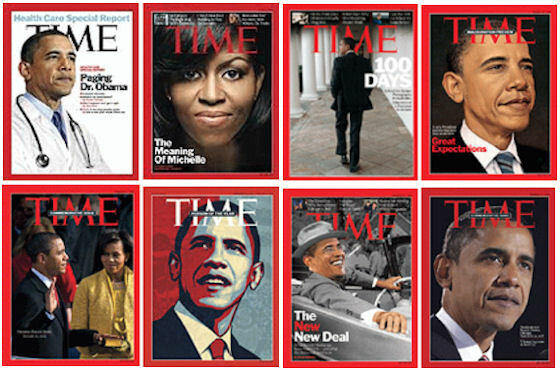 To illustrate Time's predilection, I did some graphics work of my own and created an image displaying the eight covers since the election. Go below the jump for a larger jpg.